Many people avoid exercise just because they don’t know how to do simple exercises properly (or at all) and they are too embarrassed to ask someone for help? Many people who get into exercising for the first time (or after a long layoff) injure themselves because they start an exercise program not appropriate for their level of conditioning? Another reason for this post is because many people returning from shoulder injuries require a gentle transition into regular push ups and so the steps outlined in this post should be helpful. First let me explain why push ups are such a great exercise and why they should feature in any exercise program. 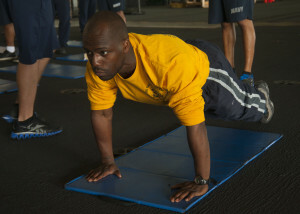 Push ups are a fantastic, full body exercise when done with good form, as they work your chest, arms, core, and legs. Another benefit, as with all bodyweight exercises, is that that are progressive and completely scalable, which makes them ideal for people of all levels of fitness. What I mean by this is that you start out at a level that is comfortable for you and then as you get stronger you swap out the current exercise for a more difficult one from the push up progression list. For example, as a beginner, you can start with wall push ups (easiest) and as you get stronger, move through the push up progressions until you can complete one armed push ups with good form (hardest). So what are the progressions? Doing a one armed variation of the standard exercise. Moving your hand position i.e. close hands, wide hands, or staggered hands are just a few examples. Altering the elevation angle, i.e. with decline push ups, increasing the elevation angle of your feet progressively until eventually you are doing Handstand Push Ups. When going through the progression levels, you need to remember that as you advance, the number of reps that you can do will drop back initially until you build the strength. For example, say you are on the knee push ups and can do 3 sets of 12 reps so it is time for you to progress to regular push ups. When you first start out doing the regular push ups, you will find that you can only do 6 or 8 reps per set. Don’t let this get you down, this is a good sign and helps to build even more strength because low repetitions at such high intensity led to more muscle growth. Before you know it you’ll be back up to 3 sets of 12 reps and it will be time to progress again, at which time you’ll take another hit to your rep count. That’s enough about that for now…this is about teaching beginners how to do push ups so they can progress so let’s go through the exercises from the above list. Stand facing a wall with your feet together and your palms against the wall, shoulder width apart, and at around armpit height (or whatever is comfortable for you). Keep your body straight from head to toe by keeping your abdominals tight as you bend your elbows until your forehead almost touches the wall in front of you, without flaring your elbows out to the side to much. Push yourself back to the starting position without flaring your elbows to much and while continuing to keep your body rigid by keeping your abdominals tight. Repeat steps 2 & 3 until you complete the set. Once you can complete 3 sets of 12 you should move onto the next progression i.e. incline push ups. If this is too much of a jump for you, as an alternative you can just move your feet out a little farther from the wall. Below is a quick video showing you the correct technique for wall pushups. The video features Mark Lauren, a fantastic fitness trainer who has a great range of products, all of which are available from our store. Incline Push Ups are very similar to the wall push ups. All you are really doing is altering the elevation angle. Stand facing an object that is around hip height (a table or bench top for example) with your feet together and your palms resting on object, shoulder width apart, so that your body is on a 45 degree angle (or whatever is comfortable for you). Keep your body straight from head to toe by keeping your abdominals tight as you bend your elbows until your chest gently “kisses” the object in front of you, without flaring your elbows out to the side to much. Once you can complete 3 sets of 12 you should move onto the next progression i.e. knee push ups. If this is too much of a jump for you, as an alternative you can just move your feet out a little farther from the object. Below is a quick tutorial video showing correct technique for incline pushups. The video features Mark Lebert using an excellent piece of equipment of his own design, the Lebert Equalizer. Knee Push Ups are very similar to regular push ups, you just utilise your knees as the pivot point instead of your feet. Lay on the ground with your feet and knees together and your palms on the ground shoulder width apart. Your thumbs should be near your armpits (or as close as you can get that remains comfortable for you). Keep your body straight from your head to your knees by keeping your abdominals tight as you push yourself up so that your arms are straight (don’t lock your elbows). This is the starting position. Keep your body straight from your head to your knees by keeping your abdominals tight as you bend your elbows until your chest gently “kisses” the ground, without flaring your elbows out to the side to much. Push yourself back to the starting position without flaring your elbows to much and while continuing to keep your body straight from your head to your knees by keeping your abdominals tight. Repeat steps 3 & 4 until you complete the set. Once you can complete 3 sets of 12 you should move onto the next progression i.e. regular push ups. Below is a quick tutorial video showing correct technique for knee pushups. Great work…you have reached the final hurdle. Master the regular push ups and you are no longer a beginner! The regular push up is essentially the same as the knee push ups, you just use your feet as the pivot point instead of your knees. Once you can complete 3 sets of 12 it official…you are no longer a beginner. Below is a quick tutorial video showing correct technique for regular pushups. From here you can start to change things up a bit. You can either move onto the next progression i.e. decline push ups or you can start adding some variations to your routine such as one armed push ups. If you chose to do some variation work, add one armed incline press ups to your routine or move your hands around i.e. close grip or wide grip push ups. I hope this article on how to do push ups for beginners was helpful to you. If you have any thoughts you would like to share, feel free to leave a comment below. Oh…and if you want to stay up to date with whats going on at Strength and Stability, sign up to our FREE newsletter below. Some great information thank you. I will admit I was always the first to shy away from exercise and push ups was one of my weak areas. It was only when I was training for the Fire Service and was given the correct tuition I found things a little easier. Wish I had this info during my youth. This is a great article. Pushups are such an underrated exercise. I remember once getting laughed at a couple years ago for doing pushups in the gym instead of benching (had a shoulder injury at the time preventing me from benching). When I returned to the bench much stronger from the much stabler shoulders, the guy didn’t find it so funny when I outbenched him. Thank you for your thoughts Aleksander….and I’m glad that you were able to make a full recovery (post shoulder surgery) and return to the bench and out-bench those that laughed at you during your recovery phase. Although here at S&S we promote calisthenics (aka bodyweight training) as opposed to weight training, as long as you are comfortable with your training and your results then that is the most important thing. In saying that, if you are “mad” about weights, then I still recommend using bodyweight exercises as part of your training. Thanks for your feedback and I hope to see you here again in the future. This article is very helpful, I really need to do some exercises and change some bad habbits food. Hey this post was great!, as a mum and horse rider trying to lose the baby weight I found this post really informative…. I never knew I was doing it all wrong. The videos are a great touch to this post and make it interesting to read then be able to watch it for visual learners like myself. Thank you for the feedback and I am glad that you found this article so helpful. Baby weight can be difficult to lose without engaging in the right form of exercise and pushups are one of the best! I’m glad you like the video tutorials as well. I hope to see you back here in the future. Take care. Hi, I really like this article! I am working on improving my exercise routine now that my body is recovered from an auto accident I was in. And I had started with a few wall pushups. So it is a delight to read your article and its encouraging gradual strategy for improvement! I really enjoyed how well written it is, the detail and the videos! I’m glad that you found the article so helpful. Wall pushups are a great place to start. If you stick to it, you’ll be knocking out regular push ups in no time! Glad I could help. Take care and I hope to see you back here soon.